Thunder gods' gold: The mountains that were god...1967. Barry Storm meets the stone maps! This work reflects the mid-1960s excitement over the stone maps and Storm weaves this new element into the tale. Of course Storm hardly needed more signs and riddles to interpret; a match made in heaven! 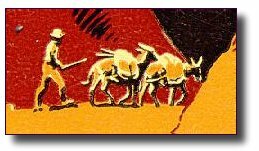 CM: "A reprint of a portion of Tales of the Southwest, this volume deals with the Superstition Mountains of Arizona, and their legendary lost mines." In fact, this is not correct. This is not merely a reprint of Book II, The Mountains That Were God from Tales of the Southwest, 1958, nor is it the rumored separate publication of Book II, The Mountains That Were God. 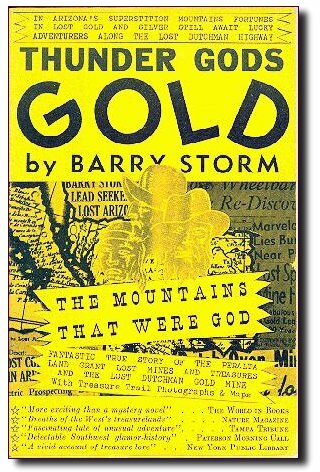 What Storm did was take the text from 1958 and remove the first chapter, In Treasureland, replacing it with an entirely new first chapter, Historical Treasure Troves. This is an important difference for here Storm takes on the project of deciphering the stone maps. Otherwise, the two texts remain almost identical except for Storm's addition of brief paragraphs to the end of most chapters. Also included at the end of the book, though in a more truncated form than in 1958, is a section on Storm's suit against Columbia Pictures over their portrayal of him in Lust For Gold, the film based on his book Thunder Gods Gold. See, I Was Swindled by Red Movie Makers for the story.